Researchers have come up with a new way to power your drinking habit. Courtesy of Rice University News Service. I take it back. The future is here. Rice University researchers have come up with a way to spray-paint a lithium-ion battery onto pretty much any smooth surface—even a beer stein. Published in Nature’s online journal, Scientific Reports, the invention means that batteries could be added to just about any object without significantly affecting its design. 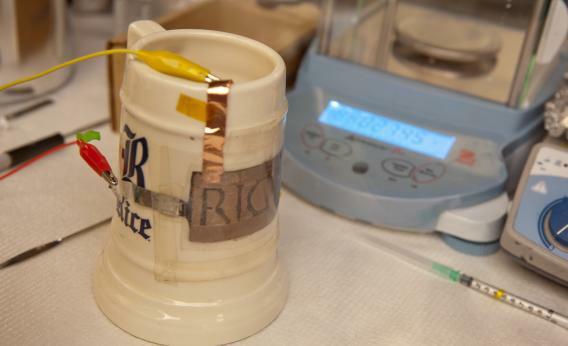 The Rice team, led by graduate student Neelam Singh, showed off its potential by spraying the battery onto glass, stainless steel, and glazed ceramic tiles, as well as a beer mug. It worked equally well on all of them. The battery is sprayed onto a surface layer by layer in a process akin to 3D printing. Applied to bathroom tiles and hooked up to a solar panel, a set of the batteries provided a steady 2.4 volts, lighting up a set of LEDs that spelled out the word “Rice” for six hours. Singh said the hope is to refine the process to the point that anyone could buy a do-it-yourself spray-on battery kit at Home Depot. For now, though, one of the components could explode if exposed to oxygen, so it’s best not to try this at home—especially if you’ve been drinking.